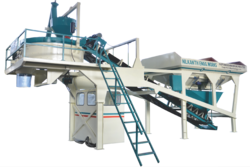 Our product range includes a wide range of compact concrete batching plant. "NILKANTH" NE-20 Model (Compact ) Batching Plant is faster & easy erection / dismantling at site. It has all welded frame structure & comes fully assembled from factory in three parts. It can be installed at site with an ordinary “Pick & Carry” crane available locally. Requires only few hours for installation. A Low Maintenance Plant: Engineered to perfection, "Nilkanth" Batching Plant requires minimum maintenance, thus assuring continuous performance. We have invested heavily in state-of-the-art designing & manufacturing techniques to make the equipment, which is not only efficient, but also performs in tough conditions. Compact Overall Size: Sleek designed "Nilkanth" Batching Plant requires very less installation area & minimum civil works and hence good saving for the customers.